Love, Mrs. Mommy: Teleflora Mother's Day $75 Gift Card Giveaway! 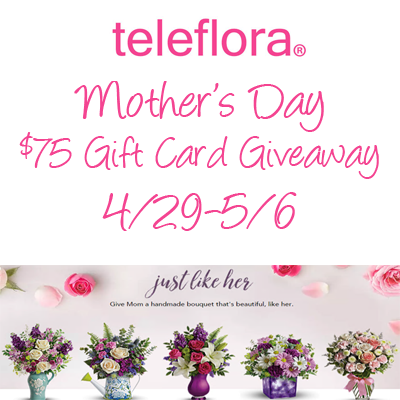 Teleflora Mother's Day $75 Gift Card Giveaway! What Mommy wouldn't love to receive a beautiful flower arrangement on Mother's Day?! Enter for your chance to win! Zen Artristry is my favorite. Love "Make Her Day", thanks for the chance! It is hard just to choose one. For me, I think I would choose the Dreaming in Pink long stemmed roses. My favorite is the Spring Favorites basket but I seen a few others that I loved too.